The future of communications is rapidly progressing. With high-speed broadband becoming a basic requirement in daily life, extensive changes are being made to regulations and federal deployment plans. Initiatives such as the Connect America Fund and the Linelife Program are gaining momentum to help rural areas and lower-income Americans receive high-speed broadband or telephone service. The rank of broadband and telecommunications as a basic right is changing how providers conduct business. More than ever, it is vital to properly maintain existing assets and the real estate that houses them. A data-first environment is crucial. Proactive decision-making for asset owners and occupants of underground infrastructure begins with looking at what’s under the surface, knowing where each individual asset lives, and tracking activity in every manhole and handhole. Asset owners who are investing in inspection are repeatedly surprised at the outcomes. In this five-part blog series, we invite you to take an in-depth look at the details of conduit vault inspections. We dig deep to find out what the state of conduit vaults truly are, what inspectors are finding, and the ramifications of conducting an audit (versus the consequences of unawareness). To begin, let us look at a few basics. Underground conduit is an inter-connected web of infrastructure that houses years of history and technological progression. These structures are typically located under roadways, sidewalks, and easements of urban and residential areas. Some of America’s most-populated metro and urban conduit looks like that of underground New York— a multilayered underworld that has developed in parallel with the needs of society. The lowest level of the Manhattan conduit system begins with the oldest layer—the railroad. In between the railroad and the surface is a world of communication, transportation, and utilities (under-river tunnels, train stations, storm drains, underground mail systems, and so on). Our communications and electric power systems typically lie at the top level of a multilayer underground arrangement such as that of New York. There are many working parts of the underground world. For service providers to keep up with changing times, grow revenue, and increase speed to market for available services, asset organization is imperative. 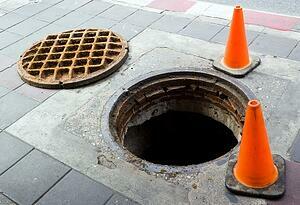 Underground assets—copper, fiber, coax—are housed in manholes or handholes. Manholes give access to underground electric utility and telecommunications cables and wires, and are used for adding or repairing cables. Typically, manholes are large enough for a person to comfortably stand in, and sometimes walk in, but that’s about it. They may not be ventilated and most have water run-off at the bottom, requiring extensive pre-audit and maintenance processes. The longer the facilities go unchecked, the longer adverse conditions build up. Handholes are a shallow form of manhole, meant to hold wires or cables accessed from above ground. Sometimes handholes rest on top of manholes, allowing repair or removal of the top layer of ducts. Only large enough for a hand or an arm, they are accessible and make repairs less complicated for field technicians. Pedestals are the rectangular boxes that we often see sticking up out of the ground in residential areas. A pedestal is very similar to a handhole in that it houses the major fiber-optic or copper that runs through the neighborhood. Pedestals are usually placed on top of vaults. The problem many asset owners are facing is not knowing where specific assets are or what is happening in their own real estate. Longitude and latitude points may not be properly plotted, photographs are not taken or readily accessible, and trespassers are given exceptional amounts of time to sneak into vaults to illegally take up rent space. Companies who invest in vault audits are persistently finding that damage, violations, storm unpreparedness, and unhealthy water conditions exist underground. Typically audits are only performed every five years—if at all—and that’s a lot of time for things to go wrong. Ultimately, these conditions lead to poor customer service, loss of revenue, or competitive advantage, which we will discuss later on the series. This complex web of infrastructure is crucial to society—businesses, customers, our neighbors, schools, the list goes on. Over the next few articles, we will identify types of damage, violation, and finding trespass. We will explore the potential consequences of neglecting valuable underground real estate, and the benefits of consistent inspection. Let’s find out what lies beneath and begin to unlock the mysteries of the copious vaults across the nation.